Combining precision with creativity. 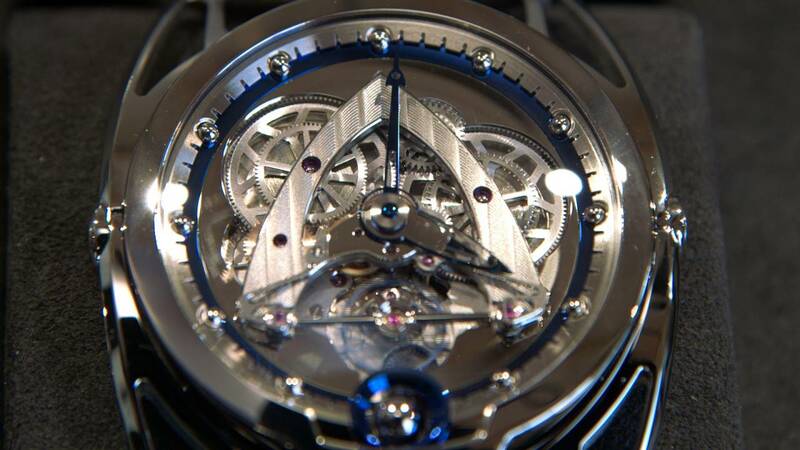 That's the promise made by the great watchmakers. The best examples of the art have gathered until November 14th at the Museum of Art and History of Geneva, Switzerland. The jury of the Grand Prix d'Horlogerie de Genève has chosen 72 watches to be in competion at the 18th edition of the Grand Prix for the prestigious "Aiguille d'Or" trophy, among other prizes. Two new prizes will be starring at the 2018 edition: the Audacity prize, which rewards creative freedom and the Challenge Watch Prize, which rewards excellence at modest prices, if hovering around 1000 euros for the cheapest is your idea of modest, that is. "Watches and watchmaking go beyond the generations, it is also a matter of transmitting values from father to son.There is something eternal in the measurement of time represented here by these watches," says the Presient of the GPHG Foundation, Raymond Loretan. The watchmaking art includes several disciplines, such as the mechanisms of these outstanding timepieces, which are very complex. Developing this kind of watch takes several years of work, from the initial idea to the final result. "The development of these exceptional instruments is being done in general by a technical office and the watchmaker will take a while. These technical plans have to be realized, but as this is haute horlogerie, even the elements you will never see will be decorated, bevelled, polished, or engraved entirely by hand," says watch specialist Balthasar De Pury. At the end of the chain, the skilled touch of the watchmaker is essential to breathe life into this mechanical puzzle. "Today's watchmakers would be excellent surgeons, because when you see a cog that is barely the thickness of a hair or a pinion that is the size of a grain of sand, we are dealing with the 'infinitely small," adds De Pury. These craft artworks, firmly linked to values like tradition and expertise, have risen to the challenges of a market that has deeply changed over the years, The profession definitely has a long story ahead, which is also the objective of the Grand Prix's organizers. "My goal would be to affirm the Grand Prix's international character more, to transform it into a kind of Oscars for the world's watches. But the Grand Prix's mission doesn't only focus on price. It is also a way of promoting an entire industry, an art, the creation of watches, beyond generations and beyond our borders," concludes Loretan.